It’s never a good day when you flush the toilet and hear the gurgle from the tub or sink. It’s important to accurately diagnose where the problem is, because repairs can vary depending on where and what the problem is. Here we look at how to handle septic system backups and clogs. There are a variety of things that can cause a septic system to fail. Something as simple as a toy or article of clothing flushed down the toilet can back up the system and cause smells or worse in your home. Usually the first sign a property owner has of a failure in the septic system is smells in the house, slow drains, backed up water in toilets, tubs, and sinks or the presence of water on the ground outside. It’s critical to take the steps to figure out where the problem is, as tearing the yard with a backhoe is expensive. The first thing you want to do is figure out if you are having a plumbing issue, or a septic system problem. The way to figure out if you’ve got a single drain problem and a whole home or building blockage is to test some of the other drains. If it’s just that one drain in the kitchen but everything else in the house is draining fine, you probably have a clog in the plumbing inside the house. However if all the drains in the house are draining slow or backing up, you have a problem with the whole waste disposal system. First off you want to make sure that it is a clog or blockage inside the building. Whether it’s a house or apartment complex you’ll need to check the function of all the drains in the structure. Sometimes upper floor drains will continue to function even if there is a main blockage. This means when the upper floors use their water, the contents can back up into your ground floor apartments. If all the drains in the basement levels are working yet there is a drain or toilet that isn’t working you have a clog at that site. Next we need to take a look at the history of the fixture. If it’s always ran a bit slow it could be a minor blockage. However if it used to drain quickly and now takes forever to drain you might be looking at a blockage in the vent, drain or waste lines. Again, if it’s all the drains in the building you are probably looking at a main line problem that’s preventing the waste water from getting to the septic system. That or you might be looking a septic system that has stopped working or is full. There are a few things you can do for yourself before calling a professional, if you are feeling handy. Sinks and tubs have traps. Traps are a bend in the plumbing that goes down in a U shape. Step #1 – Open up the cabinet under your sink and look for the PVC piping. You’ll see a series of connections. 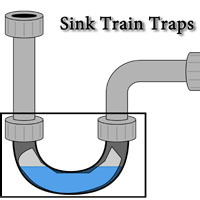 The pipe leading from the bottom of the sink, down to a U shaped section (the trap), and then another elbow joint that connects the trap to the wall drain. Set a bucket down under your work area and then loosen the connections to the trap. Water might start to drain out, so don’t have your favorite t-shirt on. Take that section out and blast through it with your garden hose. If you don’t have a garden hose try to clear the blockage without letting it just go down another drain. Step #2 – If it’s your toilet, use a plunger to just create enough pressure to move a small blockage down the line. Sometimes if the water level isn’t too high you can pour some hot tap water in to create a quick spike in pressure that will kick the blockage loose. Step #3 – Harder clogs and blockages will require the use of a plumbing snake, and this is usually where most homeowners seek the help of professionals. Kinetic water rams can also be used to clear these blockages, but most people don’t just have one lying around. These tools tend to need practice and leaving this to the professionals can save you frustration and potential damage to your plumbing system. If you’ve got this far and it isn’t draining it is undeniable that you are going to need some help. A professional will be able to help you determine for sure if you are having a drain waste vent problem or if the blockage is outside. This is done by a professional opening up fixture drains, or the whole home drain where the entire house’s waste water exits. The professionals have the tools, experience and knowledge necessary to either fix the problem, or give you further information about why your system isn’t working. When the pros take over there are a few things that might happen. What exactly is necessary depends on what problem you have with your system. Here are a few of the steps you can expect a professional to take in clearing the blockage. This is a common problem when you have slow draining fixtures. Air needs to come back into the system and the vent allows this to happen. On occasion birds might build nests that block the drain-vent, or other small animals might crawl into and get stuck in these pipes. If you live in a particularly cold environment there is a potential for freezing that will prevent these vents from working. At times the PVC drainage pipe that leads from your house to the septic system can become damaged. This can happen when large equipment drives over it, or even things like roots can break through and cause failures. This is a little frustrating but much less costly than replacing an entire septic system. Professionals can help find, clear, and repair broken sections of your pipe leading to your septic system. Professionals will snake the line to the septic system and try to identify if and where you might have root damage, blockages, or other failures in your line. This will either clear the blockage or have you back in business or it will help the pros know where the damage or blockage is. This will help them determine where to dig, instead of digging up your entire yard. If all the pipes, drains, vents, and traps are clear then the likely culprit is the septic system itself. This can happen for a variety of reasons. Control panels wear out, toilet paper is used that isn’t septic friendly, leech fields become clogged, and a host of other problems. Professional septic companies can help you figure out what exactly is wrong and help you find an affordable way to get it working again. Depending on the design of your system different costs might be involved in repairing or replacing your failed septic system. If you’ve got yourself a septic system and the drains are backing up don’t wait to see if it just gets better. Give the professionals a call and stop septic systems from ruining your home and costing you even more money. 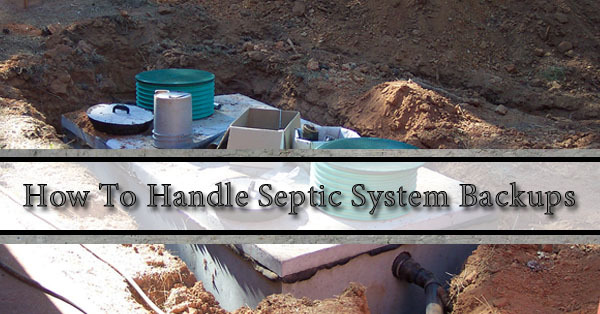 Call A-American Septic Service at 602-455-3878 for more information.